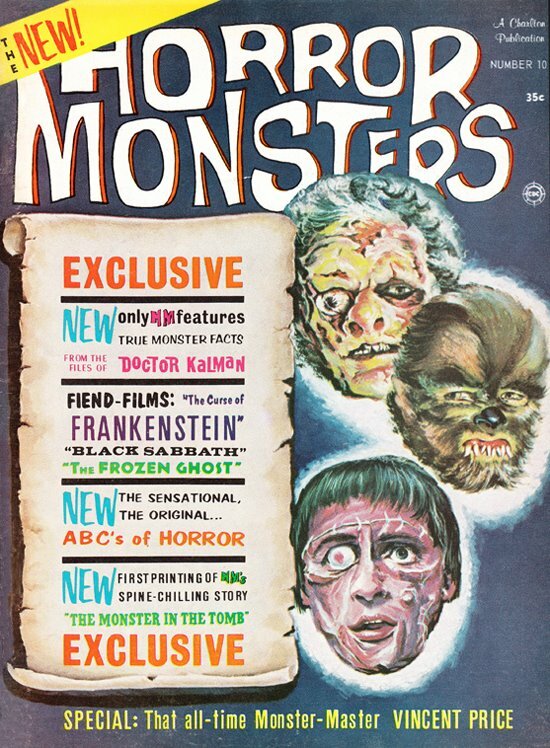 I always thought the monsters on the cover of Horror Monsters number 10 (winter 1974) looked cute and cuddly, like wide-eyed kiddy versions of the Teenage Frankenstein, Teenage Werewolf, and Christopher Lee’s Frankenstein Monster. As with all the Charlton horror movie mags, the cover artist, editors and feature writers are not identified, though some of the material shows a good knowledge of the films covered. The Charlton titles were a cheaply produced, a little crude, a little gaudy, and a lot of fun. My previous Charlton magazine posts: Horror Monsters No.2, and Mad Monsters No.5. FUN magazine cover. LOVE those vintage horror illustrations! Have a Vonderful holiday weekend! "...i miss Charlton Comics ... they had *something*..."
-the Editorial policy kept folks like Ditko, Sutton, Cuti, Staton, & Boyette there. It was, basically, "you do the material whatever way you want, and we'll print it!" >"you do the material whatever way you want, and we'll print it!"